At this stage NTR propulsion appears viable for certain fast, possibly manned, interplanetary missions; also, for some fast robotic missions in the outer Earth neighborhood (e.g., for asteroid defence). NTR is being also investigated as a replacement of commercial space launchers, although its is doubtful that it could be accepted under existing regulations (and fears) concerning the use of nuclear energy in space. Similar considerations hold for its application to OTVs (space tugs). Of interest to OTV are missions to clean up space debris from near-Earth space: nuclear-powered OTV could tow dead satellites and last stages from LEO and GEO to much more distant "graveyard'' orbits. Probably this last class of mission could become respectable only if instead of NTR the propulsion system was nuclear electric (see sections below), but the drawback would certainly be a much longer towing time. A special task NTR can accomplish faster and cheaper is changing the orbital plane of near-Earth spacecraft, a maneuver very costly in AV, as seen in Chapter 5. While NTR for manned missions is probably far in the future, orbital transfer missions could have a commercial market right now, if engine and vehicle existed. The large total impulse of NTR (that is, the product of Isp times the operational lifetime of the engine) makes them ideal for this class of mission. MITEE, or even Rubbia's engine, could power a space tug, the MITEE engine featuring lower Isp but also lower volume. The major difference between these two concepts is probably the much prior work already done on the MITEE reactor. Rubbia's engine, projected to have much higher Isp, is still a concept in the developmental stage. Will the public accept nuclear power in space, including a space tug? The answer to the first part of this question is likely to be a qualified yes, while that to the second is very doubtful: the tug must operate too close to Earth for comfort. In any event, a policy shift toward nuclear propulsion by any US administration, and including NASA, should be complemented by an effort to educate the public about nuclear space propulsion. No effort is in progress at this time, but the public seemed rather unconcerned, for instance, about the JIMO mission and its nuclear propulsion. Probably, it is now preoccupied with far more pressing issues. Nevertheless this is the most important issue in nuclear propulsion and the object of much speculation among experts, see [Aerospace America, 2004]. In fact, nuclear propulsion can be made much safer than any conventional rocket-propelled vehicle. 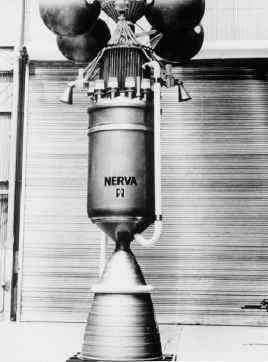 During the NERVA program no accidents occurred [Dewar, 2004]; even a deliberate thermal explosion of a Kiwi-type reactor to check for its effects (the Kiwi-TNT experiment) found them insignificant. In this context, health and safety issues associated to nuclear propulsion are summarized in Appendix A. The fact is, nuclear propulsion in general (not only NTR) is the only alternative to chemical propulsion for many commercial and non-commercial space missions otherwise prohibitively expensive. Under an ideal scenario in which nuclear propulsion was completely acceptable, a space strategy could consist of new NTR-powered launcher stages, featuring large thrust (i.e., greater than 105 N/engine) and Isp ~ 950 s-1,000 s, and of new spacecraft powered by much smaller engines of thrust ~ 103 N and with higher Isp ~ 1,500 s-2,500s. Even higher Isp propulsion may be possible farther in the future using nuclear-powered electric-ion or MPD thrusters such VASIMR (Variable Thrust and Specific Impulse Rocket), discussed in the next sections.